Geeking with Greg: Up, up, and away! 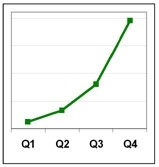 Findory.com's quarterly traffic growth for 2004. We're just about to add two additional servers. Great to see so many people using and enjoying Findory! Upward and onward! Yes, yes, the Y-axis on the graph starts at zero. Geez, guys, what kind of a geek do you think I am? Do people need desktop search? Six Apart buying Live Journal?